Once a game comes out, some game developers may go to tropical locations or re-acquaint themselves with families who they barely get to see during crunch time. 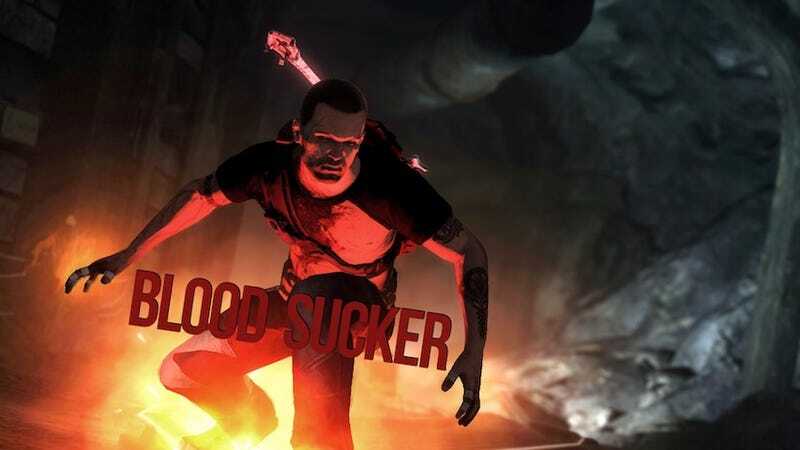 Sucker Punch did something a little different during their summer vacation: They turned Cole McGrath-the electrically-powered hero of the development studio's best-selling Infamous games-into a blood-sucking vampire. The secret origin behind Festival of Blood revolves around the artists and animators at Sucker Punch wanting to revive their creative juices. With two games taking about 6-7 years to make," says the studio's Ken Schramm, "you want to stretch your muscles in different ways." That desire, combined with the data that the majority of people who played Infamous 2 follow the good Karmic path, led Sucker Punch to turn Cole into a vampire, because it explores the dark side of being super-powered and struggling for control. In a move that differs from how most DLC gets implemented, Festival of Blood will be a standalone add-on. That means you won't need to own either of the two preceding Infamous games to play it. The decision to do standalone DLC keys in to a desire to capitalize on the 3 million downloads of Infamous 1 that happened as part of Sony's Welcome Back program after the spring's disastrous PlayStation Network outage. Festival of Blood actually focuses on Zeke, Cole's chubby, Elvis-obsessed sidekick, as he spins a tall tale while trying to pick up a woman in a bar. Zeke spins a yarn that has Cole being kidnapped by a tribe of vampires, who are led by new villain Bloody Mary. Cole's electromagnetic powers prove no match for the vampires' numbers and mystical abilities and he gets turned into a bloodsucker. Bloody Mary's disembodied voice taunts Cole throughout the missions, challenging him to find her and kill her before sun-up comes and he becomes a vampire permanently. Festival of Blood happens on Pyre Night, a Halloween-esque bacchanal. The giant demon-themed party that allows Sucker Punch to put a costume on the city of New Marais, where Infamous 2 is set. You'll see giant, destructible effigies, new NPC models and familiar locations done over to make them feel horrific. You'll also take Cole into entirely new areas like the Catacombs, the underground locale where the vampires of New Marais live. The biggest change in FOB might be the elimination of the Karma Meter, which has measured how much of an altruistic hero or a selfish vigilante you're making Cole become as the game progresses. Different powers become available depending on how good or bad you are, but Festival of Blood will have only one new set of skills-along with Cole's electrical powers—for players to unlock. One of them fundamentally changes how you get around New Marais. Shadow Swarm lets Cole fly, changing him into a swarm of bats. It works well with the new Move support that's also coming to the game. The new abilities get governed by a Corruption Meter, a beating heart which gets filled by the blood you consume from NPCs. Cole's new powers also include a Punch Blast, a wave of force that pushes enemies back and a stake kill. New powers aren't the only thing that changes in Festival of Blood. During my demo with him, animation director Billy Harper observed that vampires own the most powerful creature mythos of all the classic monsters. So, they've been made to do thing that Cole's enemies in previous games haven't been able to do. The Harpy class of enemies will be able to parkour around the environment like Cole does, meaning that the easy tactical advantage of grabbing high ground won't last very long. Part of Festival of Blood's plot will involve Firstborns, vampires that hide amongst the regular folk of New Marais, and they'll be able to turn bitten NPCs into Minions. Minions won't have full vamp powers but will be able to pick up slabs of wood and other objects in the world that can be used as weapons, which is also another new feature never seen before in an Infamous game. Lots of other little touches will differentiate Festival of Blood from the mainline Infamous games. You'll use a new skill called Vampire Vision to hunt down Firstborns and you'll see that they don't have hearts or circulatory systems Fiends, a vampire class that have been around for centuries, will use crossbows or boomerangs depending on when in history they were turned. And the Firstborn will be able to employ the same cinematic takedowns against Cole that he became able to do in Infamous 2. And the user-generated content initiative that Sucker Punch began with Infamous 2 also gets a healthy booster shot. Creators will be able to use all the shadowy, morbid assets of Festival of Blood to create new missions. In fact, Sucker Punch plucked 20 of the best UGC creators to build the first wave of missions bundled into Festival of Blood. These adventures won't be available in Infamous 2, though, and you'll only be able to access them inside of the DLC. UGC craftspeople will also be able to make the comic-book style 2D cutscenes that bridge plot points in the Infamous games. Moreover, you'll be able to use them to stitch together separate UGC missions, turning them into a larger saga with other people that you might be creating with. With Festival of Blood, Sucker Punch uses a DLC release as an opportunity for tonal variation. You're getting something familiar yet different, just as in Rockstar's zombie-filled Undead Nightmares DLC for Red Dead Redemption and BioWare's Mass Effect 2 DLC missions. In this case, Sucker Punch is forcing you to play as an evil version of Cole, but my time with Festival of Blood convinced me that being bad can be good. You'll get your chance to be drain New Marais' blood when Festival of Blood comes out on October 25th.